We have received positive feedbacks to include reviews of English movies as well apart from the Hindi ones.. We are grateful our movies recommendations are being read carefully and loved. Philadelphia , a 1993 , guttingly emotional and tragic story of how a lawyer gets fired for having AIDS . The story is considered as a bold and riveting by all means , with a stellar cast and a movie which won awards both from the critics and as well audience alike. A young Philadelphia lawyer who is infected with AIDS keeps his homosexuality hidden from his employers. When he is suddenly dismissed ,he somehow finally hires a lawyer who fights a case with his employers for his abrupt dismissal. The intense courtroom drama scenes by the cast keeps the audience on the edges of their seats.Tom Hanks gives perhaps the most powerful performance of his career as Andrew Beckett, the afflicted lawyer, thus winning an Oscar for the best actor. He hires a homophobic small time lawyer - Denzel Washington as the only willing advocate to fight for him. Movie starts with a bright senior associate Beckett (Tom Hanks) working with a big law firm in Phily who tries to hide his homosexuality and his status as an AIDS patient. Soon, employers find out his disease and tactfully dismiss him from his duties by hiding some official documents. Beckett believes that someone deliberately hid his documents to give a firm an excuse to dismiss him. Soon the battle starts - wherein Hanks vouches to take the firm to the court. Beckett tries to find several lawyers to fight his case including Joe Miller (Denzel Washington). Everyone refuses , thus, unable to find a lawyer willing to represent him, he himself is compelled to act his own attorney. While researching the case at the law library, Miller finds Beckett going through the law articles and also observes the unfair treatment meted out to him by others, he finally agrees to fight Beckett's case. 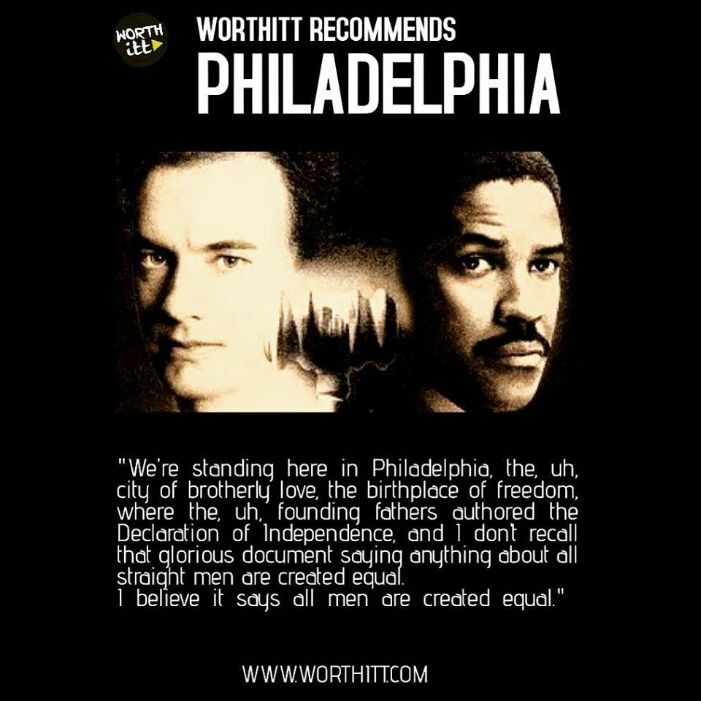 To conclude, Jonathan Demme’s “Philadelphia” is a story that’s timely and powerful, on the acknowledgment of HIV/AIDS, homosexuality and homophobia with Tom Hanks and Denzel Washington receiving wide praise for their performances in bringing awareness to the issues, and working toward lessening the stigma of having AIDS in this influential and enriching quintessential LBGTQ films. I highly recommend this to anybody looking for a great movie. The film was inspired in part of the events and lives of attorneys Geoffrey Bowers and Clarence B. Cain, as the film’s reception was overall admirable though it might indulge in some clichés but its stellar cast, sensitive direction and meaningful message are more than enough to compensate. Taglines: No one would take on his case... until one man was willing to take on the system. Tom Hanks had to lose almost thirty pounds to appear lean for his courtroom scenes. Denzel Washington, on the other hand, was asked to gain a few pounds for his role. The courtroom scenes were filmed in an actual courtroom that the city let the filmmakers use. It was not a set. The film cast includes six Oscar winners: Tom Hanks, Denzel Washington, Jason Robards, Mary Steenburgen, Joanne Woodward, and Kenneth Utt.